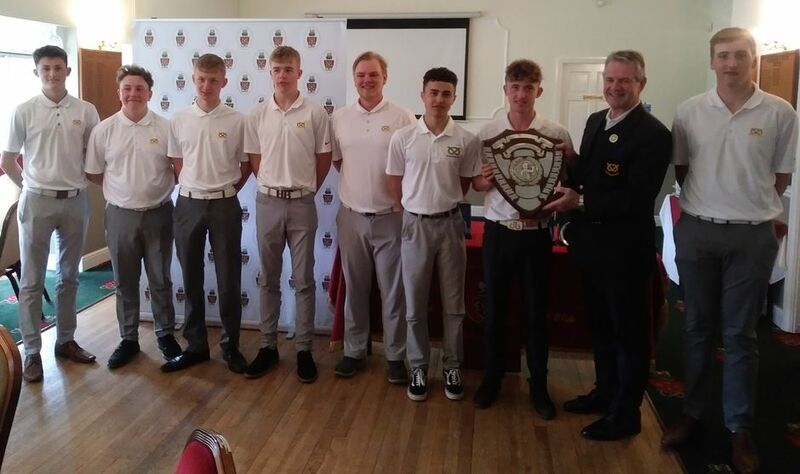 2019 Four Counties Tournament played at the excellent Drayton Park GC on the 17th/18th April saw Staffordshire boys win the event for the third year in a row. A win against Worcestershire on day one followed by two draws against Warwickshire and Gloucestershire was good enough for the overall win. A big thank you to Drayton Park GC who provided a good test of golf and went that extra mile to ensure the event ran very smoothly. Thanks must also go to the Staffs supporters for giving up their time to support the boys. Pictured below the winning team Tom Alford, Jenson Forrester, Tom Morton, Evvan Wooldridge, Alexei Glass, Yass Oakley, Captain Zarak Curley receiving the trophy from SUGC President Nick Weaver and Chris McCarthy. Staffs men travelled to North Wales last Sunday to play a friendly against North Wales. Match details from President-Elect Steve Wild. Whilst being the same for everyone the cold strong wind did not suit many all of our inland golfers but, many showed an ability to overcome the conditions and produce good performances. Overall I wasn't to disappointed as the team was very depleted and started a man down . That in itself could have greatly changed the overall result. I have made notes to pass onto our missing two team Captains regarding players of note and future selections. We were extremely well looked after and I would be grateful if the County Secretary would pass on our thanks to the N . Wales organisers . The annual match resulted in a win for the boys by 6.5 to 1.5, although the match was a lot closer than the results show as 5 of the matches went to the 18th hole. 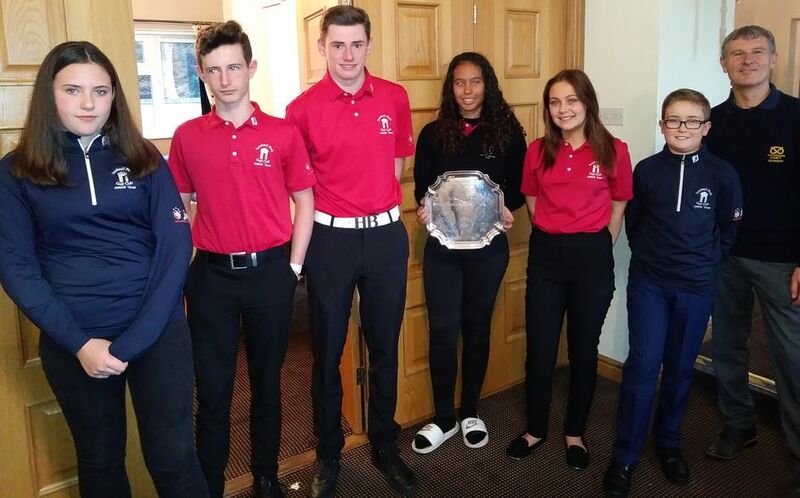 The full results can be found in the Junior section of the website, Under 14's results.Thank you to Burslem Golf Club for hosting this match and for making us very welcome. 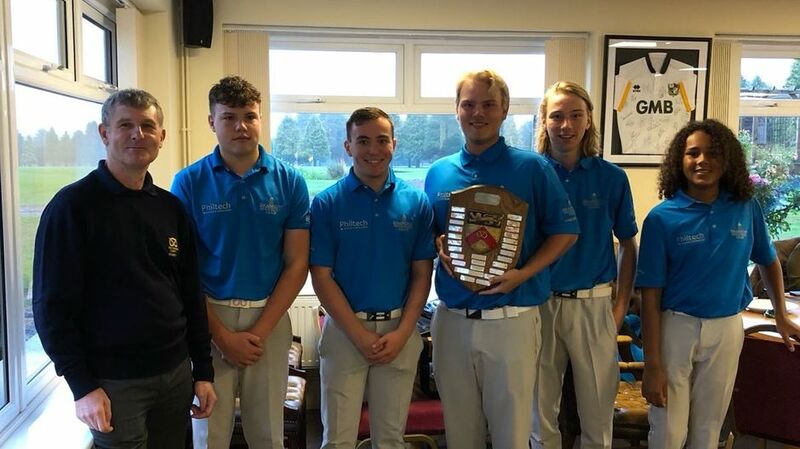 Congratulations to Sandwell Park GC who beat Walsall GC by 3.5 to 1.5 points in a closely fought final played at the very testing Uttoxeter GC. 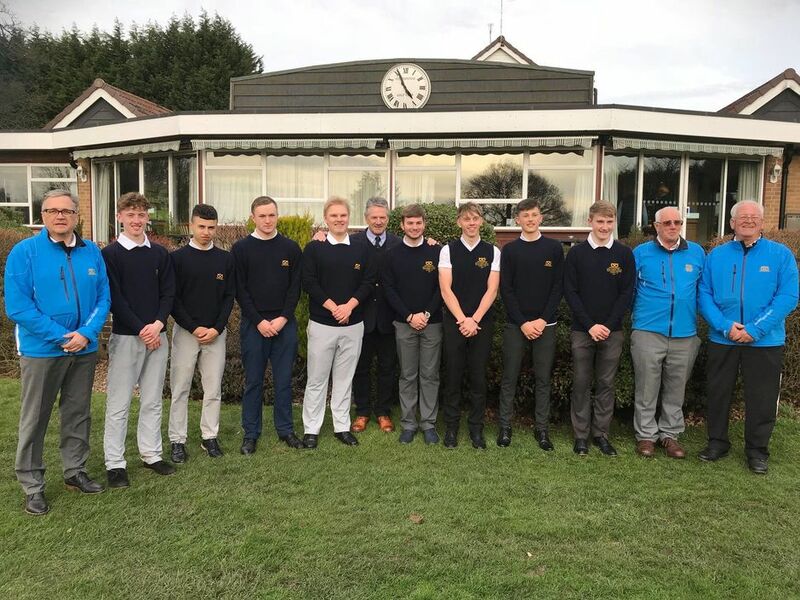 Sandwell Park GC will now represent Staffs in the England Golf Junior Club Championship in 2019. A big thank you to all the supporters, club officials and the catering staff at Uttoxeter GC for a great day. The finalists pictured below with County Secretary Malcolm Eustace. 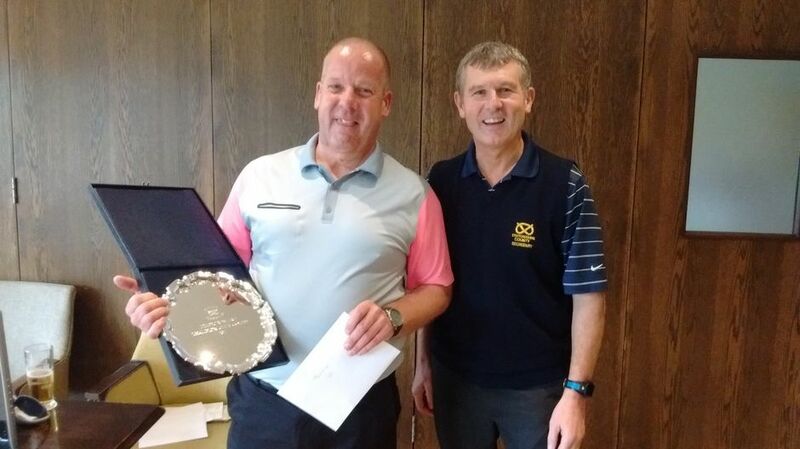 Congratulations to Martin Wainwright (Perton Park GC) winner of division 1 with a score of 37 points and Roger Waite (Little Aston GC) winner of division 2 with a score of 36 points. A great day on the testing Newcastle under Lyme GC saw some excellent golf, which resulted in a close finish in both divisions. A big thank you to Newcastle under Lyme GC members and staff for an excellent day. The Champions pictured below with County Secretary Malcolm Eustace. Congratulations to Ross Popescu and Jake Walley (Enville Golf Club) who shot a fine 72 to retain the Beddows Trophy. Andy Jones and Richard Knott (Beau Desert) were runners up with a round of 75. 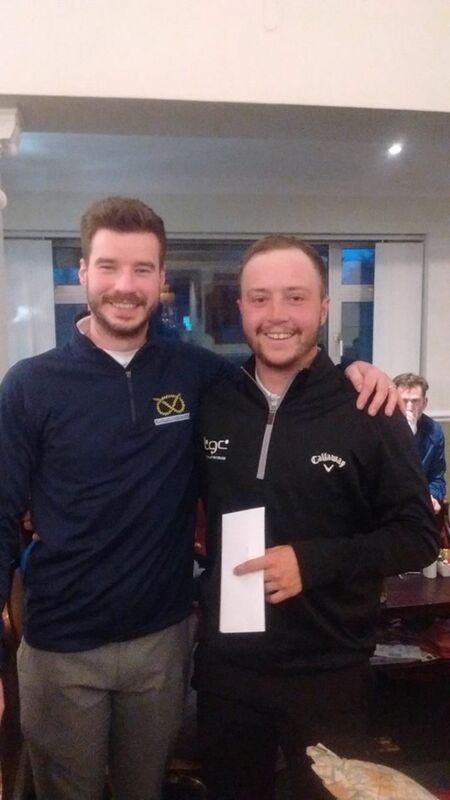 The nett competition was the reverse with Andy Jones and Richard Knott winning with a nett 71, half a shot from Ross Popescu and Jake Walley. Thanks to Leek Golf Club for hosting this event. Staffordshire Under 14's overcame a very resilient Worcestershire Under 14 side to come out winning 3 games to 2. Full results can be found under Juniors - Under 14's results. The Membership Scheme held their Autumn meeting at Walsall GC on the 6th September. Congratulations go tp Steve Gamble and Tom Keenan (Calderfields GC) who won the competition with a score of 47 Stableford points. Full results can be found on the Membership page. 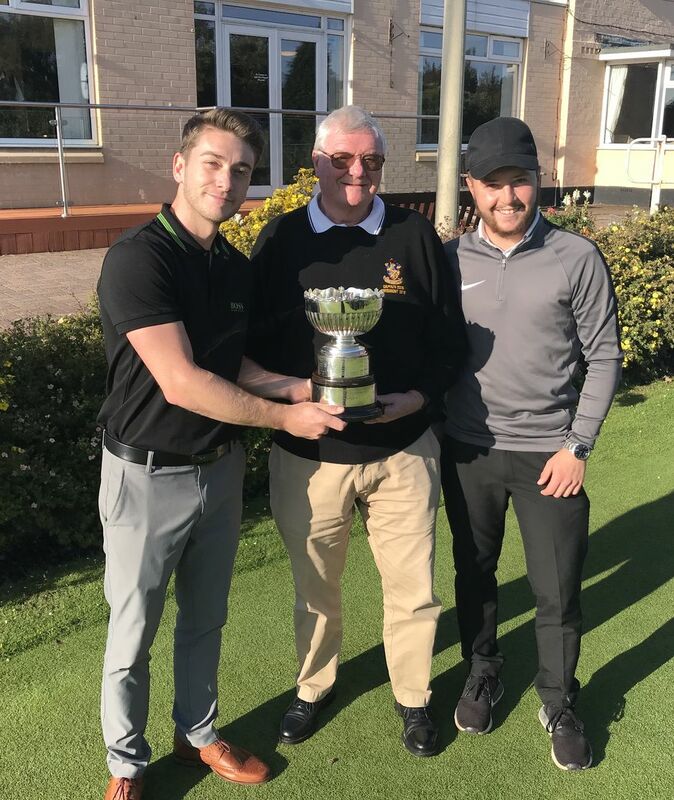 Congatulations to Sandwell Park GC who beat Trentham Park GC 3.5-1.5 and Walsall GC who beat Branston G&CC 3-2 to claim their places in the Final at Uttoxeter GC on the 22nd September. The teams pictured below with County Secretary Malcolm Eustace. 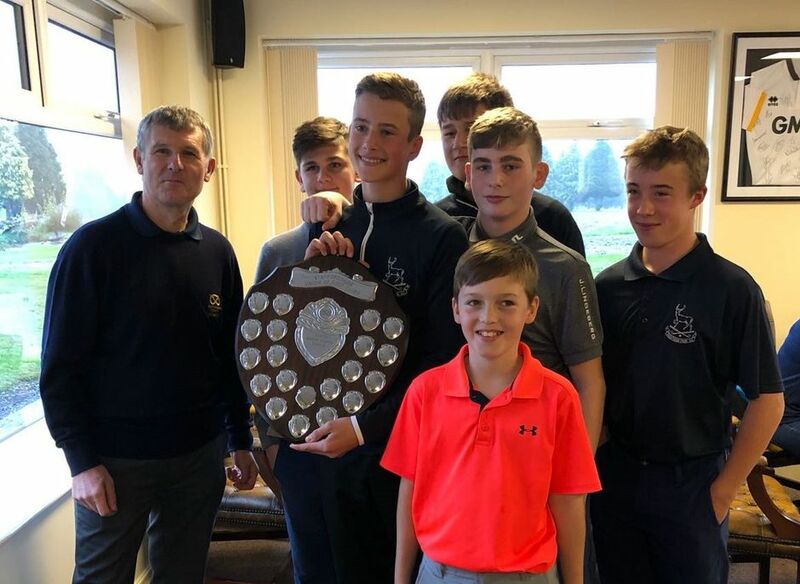 Congratulations to all boys involved and especially the winner of the 2018 Staffordshire Boys Matchplay. 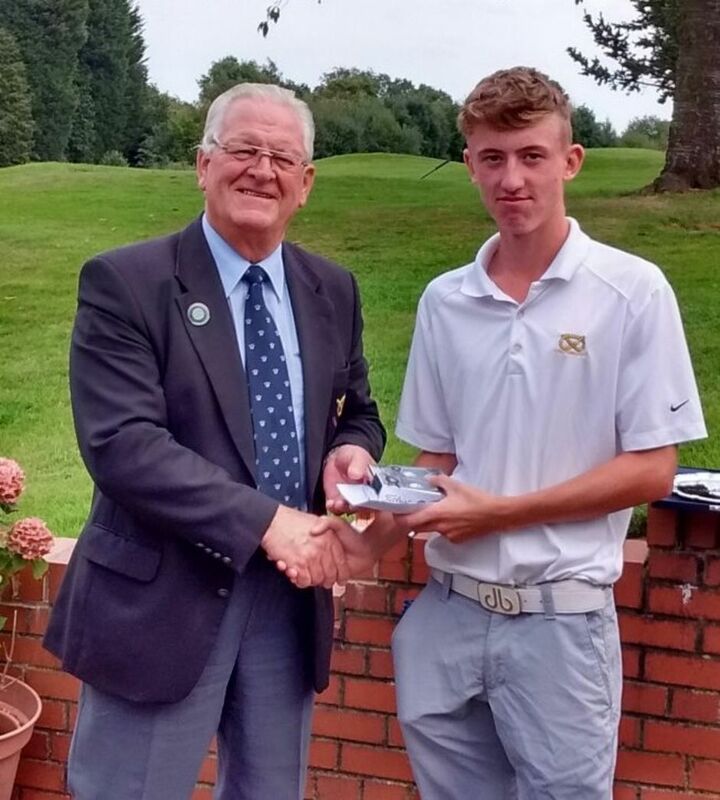 Zarak Curley from Leek GC who defeated Yassine Oakley 4 & 3 in the Final match. Many thanks to Stone GC. Excellent result for Staffordshire U16's beating Shropshire and Herfordshire 11.5 to 3.5 and Worcestershire 8.5 to 6.5 Staffordshire looking good to win the Midlands U16 League having won 3 matches with one to go. Click here for FAQs on the proposed Worldwide handicap system that is due to be implimented on the 1st January 2020. A very close hard fought match, with Staffs boys recovering from a loss 2-3 in the foursomes, but winning the singles to tie the match at 7.5 - 7.5. Hospitality provided by Leicestershire at Ullesthorpe Golf Hotel was 1st class as usual. Detailed scores under Juniors U18 Results. Congratulations to the 2018 Staffs U14 &U12 Boys Champions, Jenson Forrester (Walsall GC) 77 Gross and James Thompson (Walsall GC) 85 Gross. Pictured below with SUGC Junior Chairman Roger Waite. This mixed age group match was played at the revamped Greenway Hall GC, who made us feel very welcome in hosting their first Juniors match for a very long time. The boys all enjoyed this challenging course. Match Result: Staffs 5 Cheshire 13 Full results will be found under Juniors, Under 18 Results. 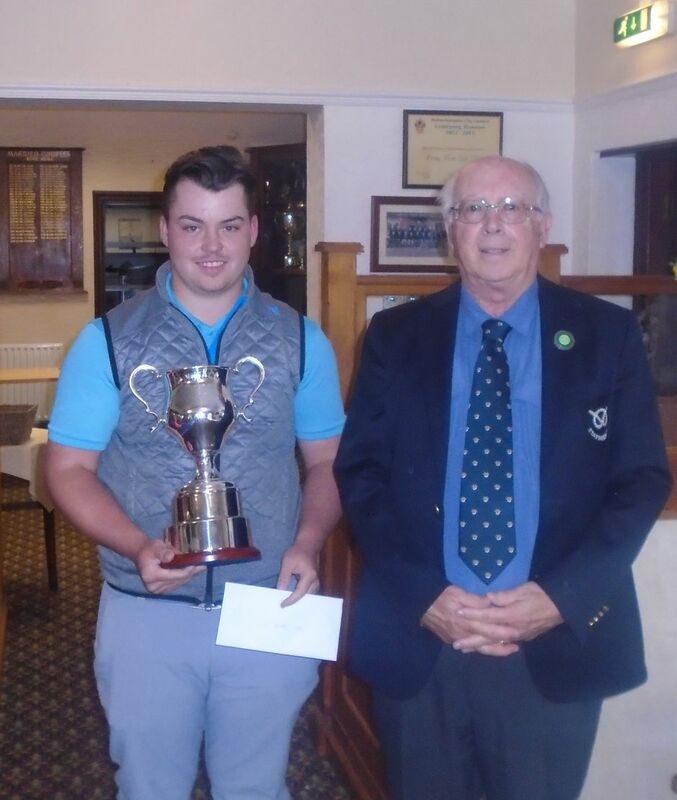 C Perrin from Great Barr Golf Club led the field to win the Geoff Marks Trophy with a creditable 41 Stableford points. Runner up was M Zivkovic, Newcastle-Under-Lyme Golf Club with 40 points. Thanks go to The Manor Golf Club for hosting this event and as usual made the Membership Scheme very welcome. The winner receiving the Geoff Marks Trophy from Barry Whitaker. Full results can be found on the Membership page. Staffordshire Under 14's finished runners up to Warwickshire. Report and scores can be found in the Junior section of the website. 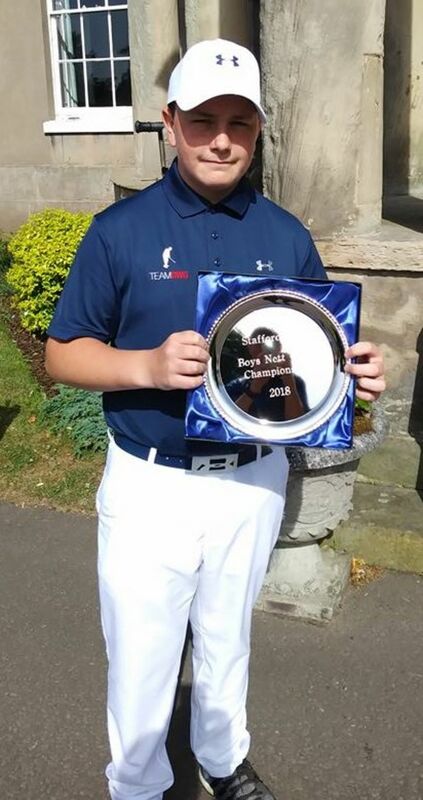 Congratulations to Tom Beasley (The Chase GC) winner of the 2018 Midland Youth Championships played at Stoke Rochford GC with an excellent 72 hole score of 271. Tom is the first ever Staffs winner of this championship. 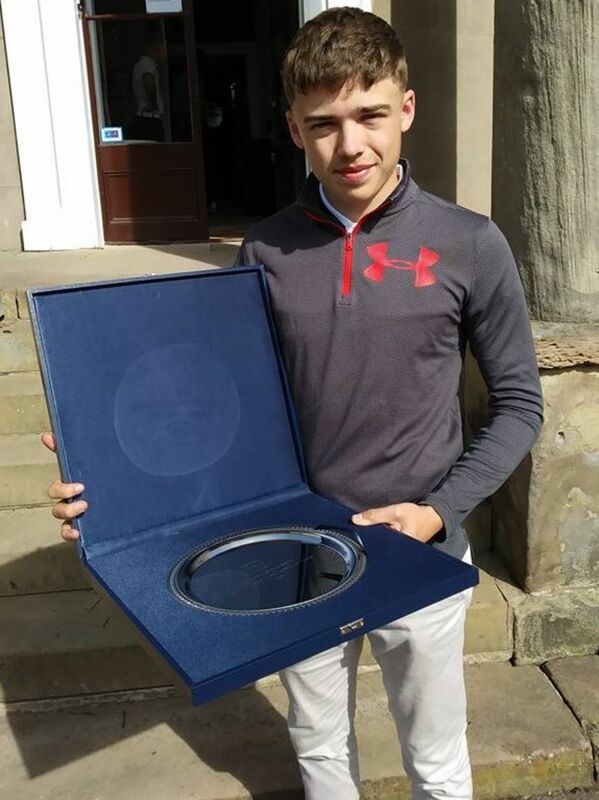 Congratulations to Matt Sheldon (Great Barr GC) winner of the Andrew Hare Salver also played at the Midland Youth Championships witha score of 69. Congratulations to Tom Beasley (The Chase GC) winner of the 2018 Staffs Matchplay Championship, beating Jack Clemson (Penn GC) by 1up. At one stage Tom was 6up but, Jack fought back to lose on the 18th. 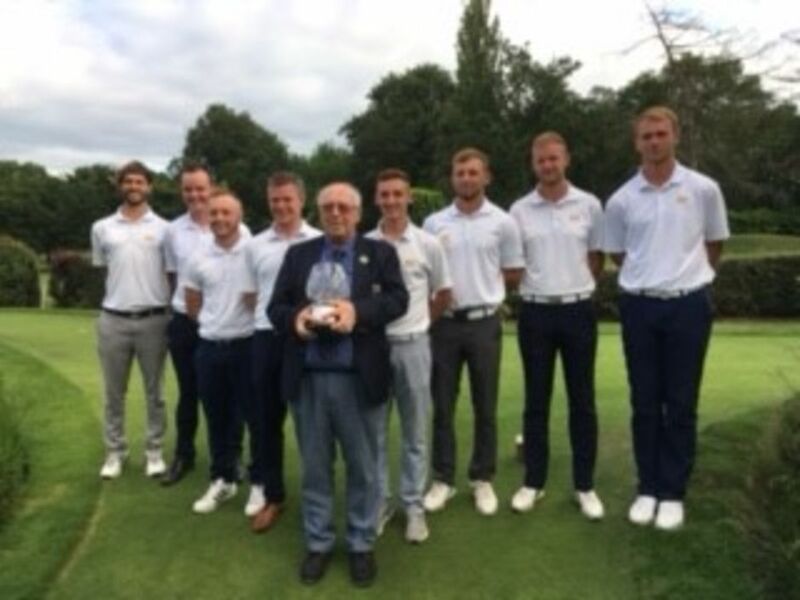 The players pictured below with Drayton Park GC Captain Alan Street. Thanks go to Drayton Park GC for a great couple of days. The course was superb. Congratulations to A Davis (Calderfields GC) and T Boot (Sandwell Park GC) on winning the Membership Scheme Summer competition at Trentham with an excellent score of 42 stableford points. A big thank you to Trentham Golf Club who made the us very welcome. Results are on the Membership Scheme page. 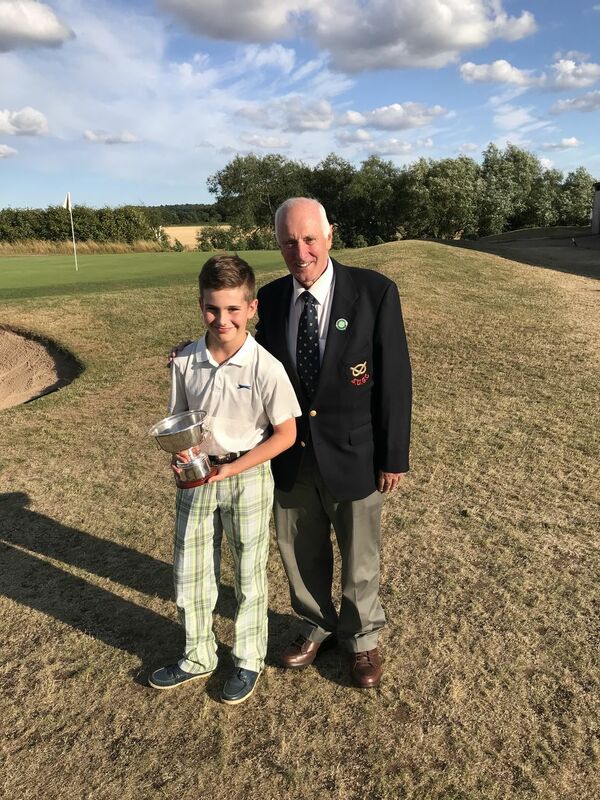 Congratulations to Tom Alford (Branston G&CC) the 2018 Staffordshire Boys Champion. Tom pictured below with Barlaston GC President Michael Bailey won by an astonishing 12 strokes with a score of 136 (67,69). Also pictured below are Boys U16 Champion Tom Hassall (Stone GC) and Jenson Forrester (Walsall GC) Boys Nett Champion. An excellent day on a good testing golf course that was in magnificent condition. Thanks go to Barlaston GC. 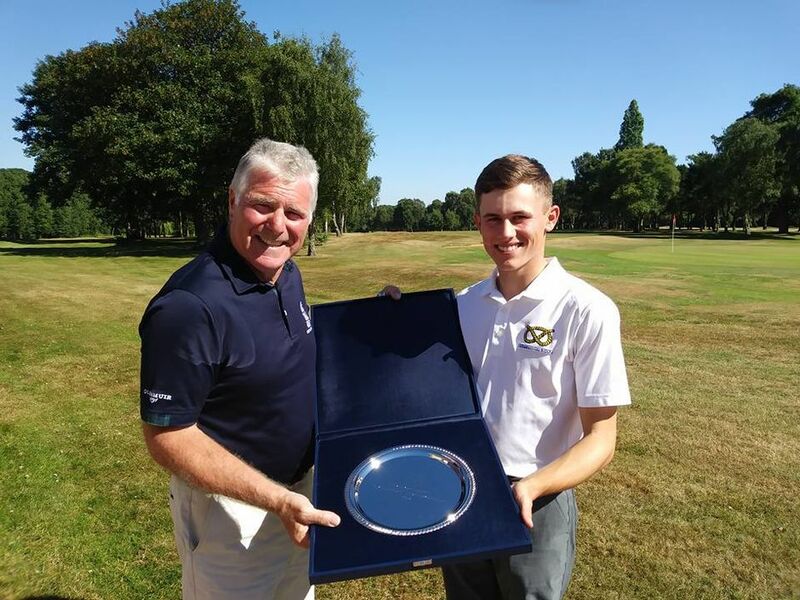 Congratulations to Ollie Read (Whittington Heath GC) the 2018 Staffs Amateur Champion with a score of 136 (68,68) -6 beating fellow Whittington Heath member Ryan Brooks by one shot 137 (68,69), third Chris Crane (South Staffs GC) (72,69), forth Mark Gayes (Westwood GC) (68,73), fifth Rob Maxfield (Wolstanton GC) (68,73), sixth Tom Hewitt (South Staffs GC) (73,69). 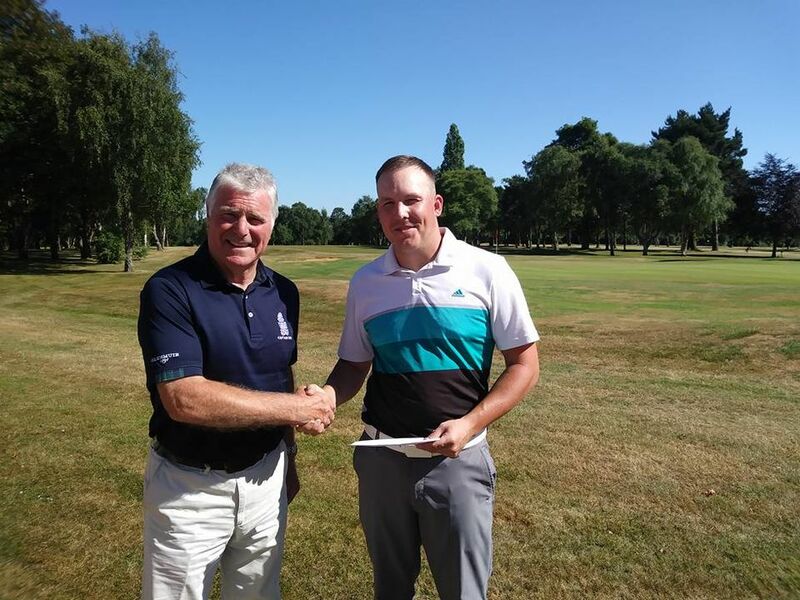 1st nett Chris Elton (Drayton Park GC (66,67), second Brad Hill (The Chase GC) (72,66). third Alexei Glass (Branston G&CC) (71,67). Scarf Shield winners South Staffs GC. The winner pictured below Drayton Park GC Captain Alan Street and SUGC President Nick Weaver. A big thanks to Drayton Park GC for a great day. Staffordshire have three boys going to the English Schools County Finals in June. Alexi Glass, Tom Alford and Matt Sheldon finished in the top 10 at the Midland Schools Championships and will represent the Midlands at the National Finals. Ethan Evans missed out by one shot for an automatic place but is first reserve. Congratulations to all the boys who took part. 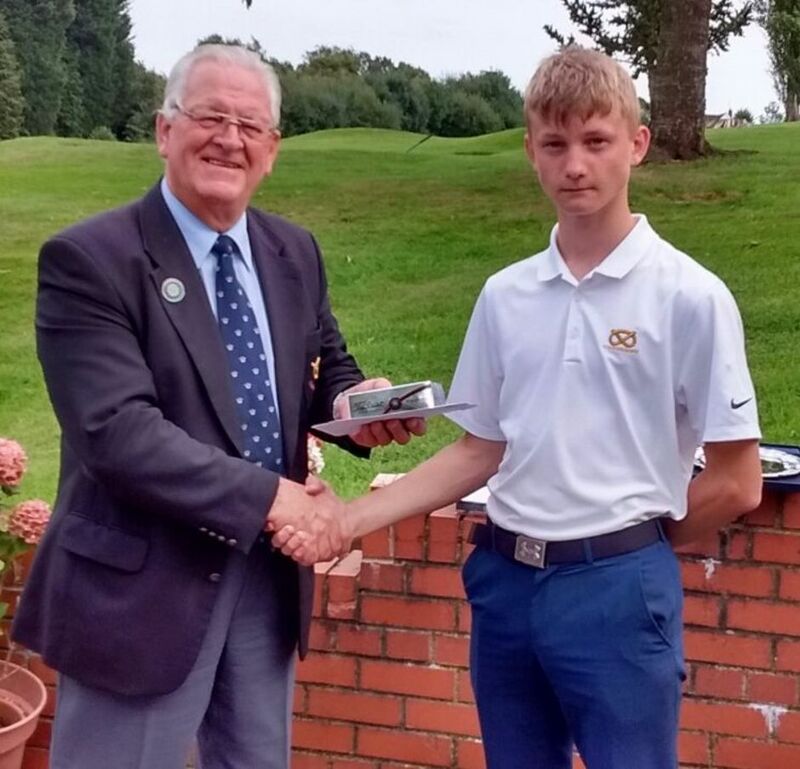 Congratulations to Ellis Muckley (Great Barr GC) wiiner of the Staffs Boys Open Championship for the second year running. 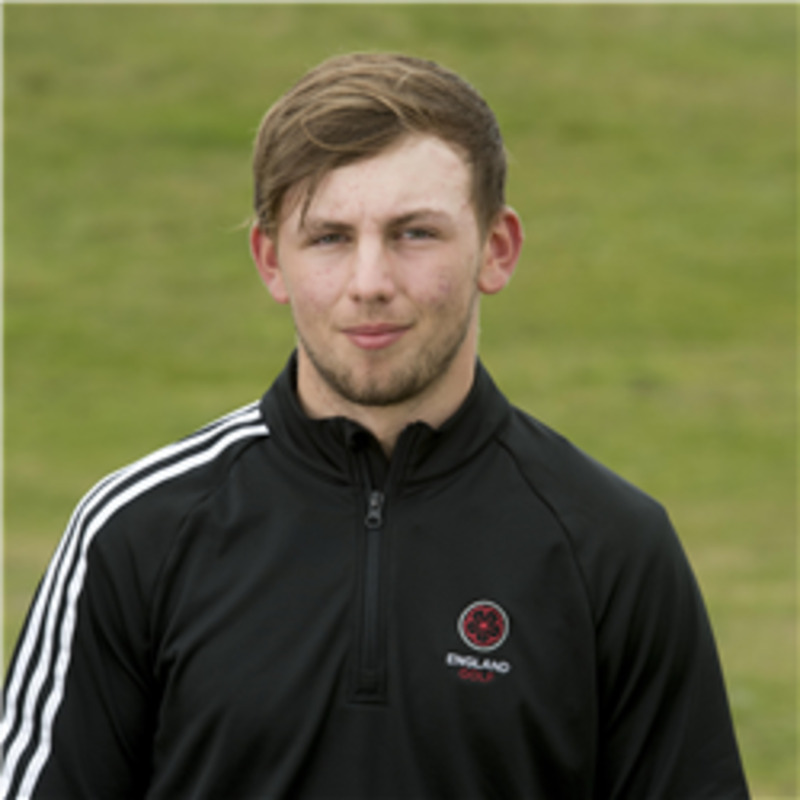 A close affair with runner-up Staffs U18 Captain James Wilkes (The Staffordshire GC) shooting the same score of 77, 74 losing on countback. A great day at the magnificent Sandwell Park GC, saw 32 players competing, with some excellent golf witnessed by the spectators. A big thank you to all the officials, parents and staff of Sandwell Park GC for another successful championship. 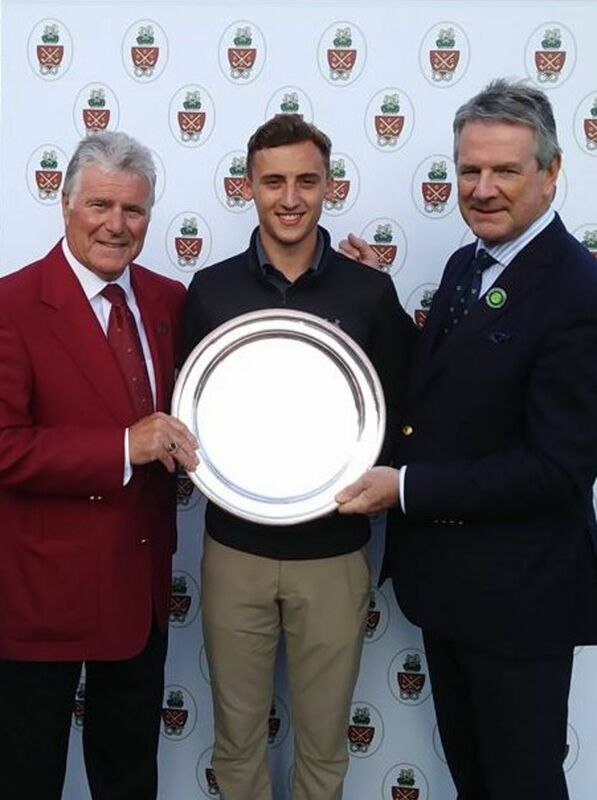 The winner Ellis Muckley pictured below with Sandwell Park GC Captain Angus MacKenzie and SUGC President Nick Weaver. The spring meeting of the Membership Scheme was won by G Sands and J Ballayntyne with 43 points. Staffordshire 1st Team v Leicestershire and Rutland at Penn GC 8th April. Our annual pre season friendly against Leicestershire and Rutland. We had a very warm welcome from Penn Golf Club. The course was in good condition considering the terrible weather in the weeks leading up to the game. Hopefully this game would get the season off to a positive start. Match 1 saw England international Jack Gaunt (Drayton Park) paired with the ever present Ryan Brooks (Whittington Heath). they got the first point on the board early on with a confortable 6&5 victory. Match 2 was Jake Walley (Enville) paired with Simon Higgins (The Chase) who were narrowly defeated in a close game 3&2.Pair 3 were the boys from Ingestre Louios Birchall and Matt Downes who came through clinching their match on the 17 with a 2&1 victory. We put the anchor men out in the 4th with Tom Hewitt (South Staffs) paired with Rich Hunt (Drayton park) , who battled until the last to earn Staffordshire another half a point. Myself (Chris Crane South Staffs ) were the last group out paired with club team mate James Murphy (South Staffs) how unfortunately lost on the 16th 3&2. So this left the spoils even at 2.5-2.5 going in to the afternoon Singles. Our number 1 lead the team from the front and put us ahead again with a comfortable 4&3 victory. Ryan was taken all the way to the last and came out with a half point still advantage Staffordshire. Another game went all the way to the last with Jake extending our lead with a 1up victory. The 18 saw more action in the 4th singles with Simon holding on to claim another half point for the team. Matt battled all the way to the end narrowly losing 1down, Louis was the next man out and yet another game was going down the last. he showed his determination and class holding his nerve to win his game on the last for a 1up victory. The next man to claim his point was Tom with an emphatic 6&5 victory to putting us 1 point from victory. Unfortunately we were made to wait with the next to games going the visitors way with both Rich and James loosing 2&1. I was out last and didn't know at the times but I managed to come through with the winning point claiming victory 3&2. All in all a great start to the season and nice to get off to a winning start all be it close in the end I congratulate all my players who held their nerve on the last hole to give us victory. Finally, I would like to thank all those in attendance how came to support the team throughout the day, it is always greatly appreciated by myself and the Team. Staffs boys retain the title beating Warwickshire, Worcestersire and Gloucestershire. 41 of Staffs finest amateurs played in this years trial at Drayton Park GC. 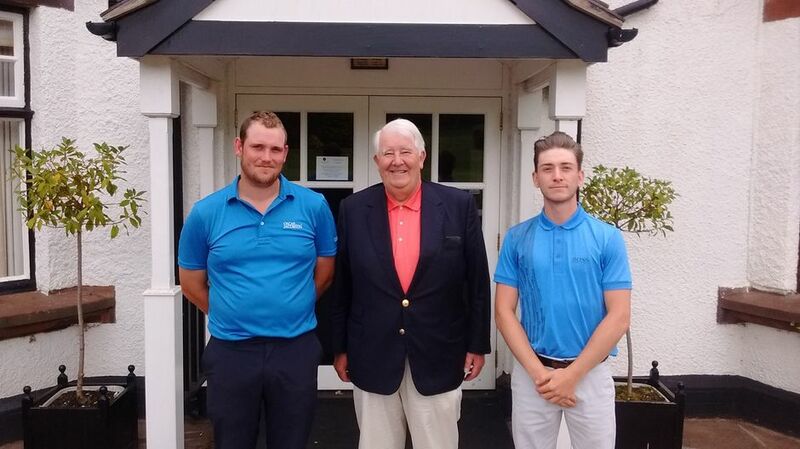 Best score on the day went to Jake Walley (Enville GC) with 69 gross, pictured below left with Staffs 1st team Captain Chris Crane (South Staffs GC), closely followed by Tom Hewitt (South Staffs GC) and Ryan Brooks (Whittington Heath GC) pictured below right with 71 gross. Thanks go to Drayton Park GC for allowing us use of their golf course, which was in excellent condition and their hospitality. 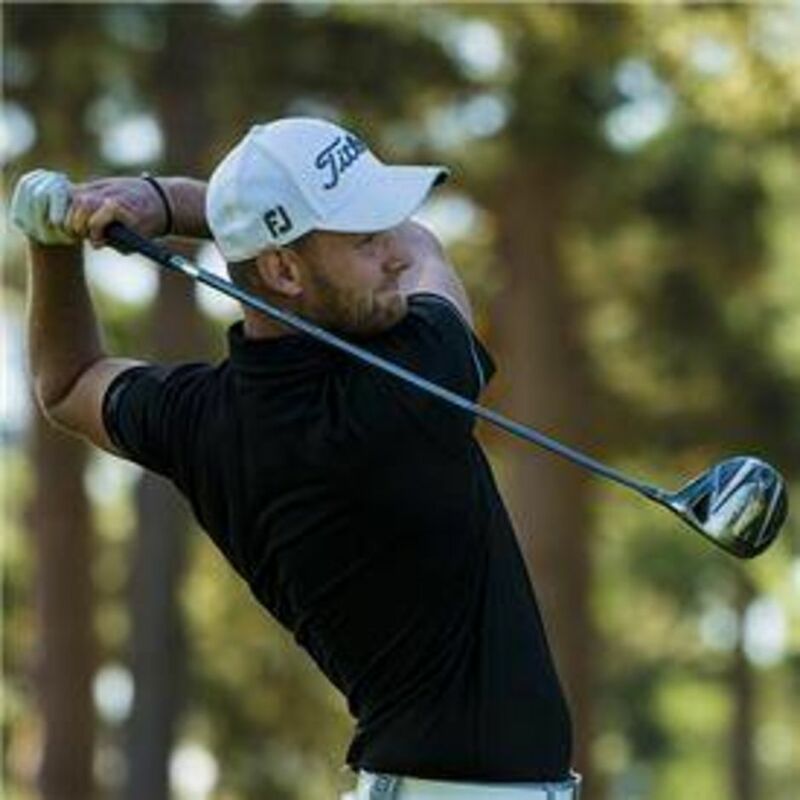 Congratulations to Gian-Marco Petrozzi winning the NSW Australian Amateur Championship played at Royal Canberra GC. 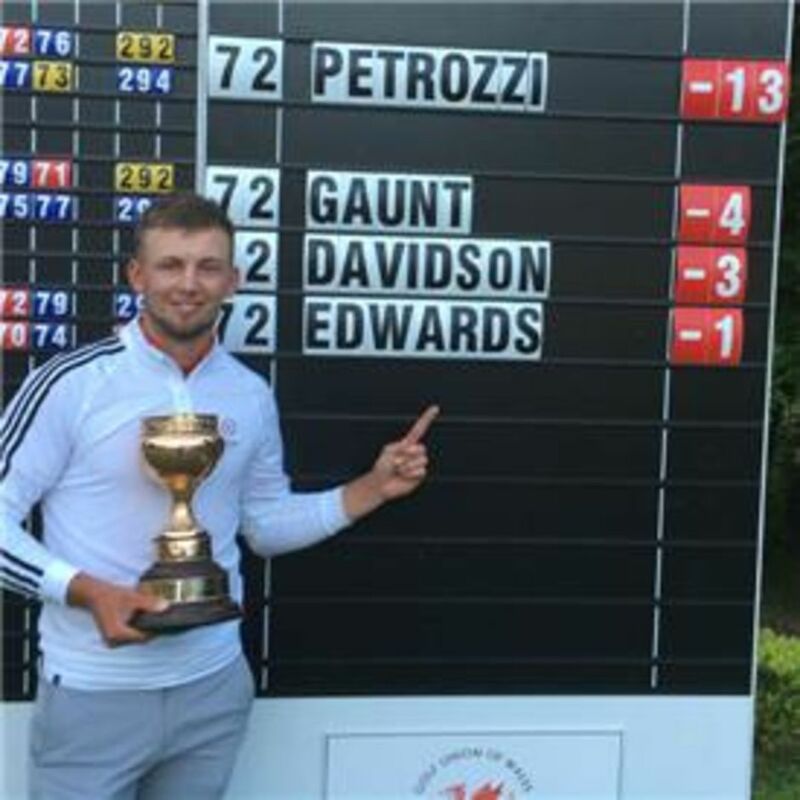 Gian part of the England Golf Men's Elite Squad capped a great week by holing a 45 foot eagle putt on the 37th hole for victory. Great for England, great for Staffordshire, but even greater for Gian who will move even further up the World Amateur golf rankings. 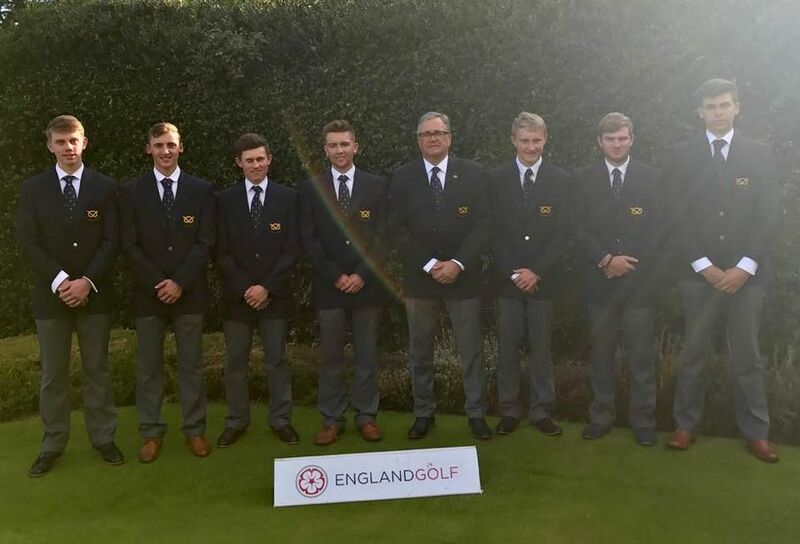 Congratulations to Gian-Marco Petrozzi (Trentham GC) and Jack Gaunt (Drayton Park GC) who have been named in the 2017/18 England Men's elite squad. A culmination of the dedication and hard work that both players have put in over many years now. Staffordshire are very proud. Staffs men finished 3rd in the County Finals. This prestegious event saw us play round robin over three days against Northumberland, Somerset and Hampshire. After the first day Staffs were leading thanks to a victory against Northumberland, however, a narrow defeat against Somerset on day two meant we had to beat Hampshire on day three. The players tried their best, but Hampshire proved to strong. A great experience for the players, officials and supporters, i'm sure we will comeback stronger for 2018. Thanks must go to Martin Payne, Nick Weaver, Terry Leece, Andrew Dathan and the relatives of several of the players for their support over the three days, it's very much appreciated. Thanks must also go to Captain Martin Crook, his right hand men in Brian Belcher, Chris Crane and James Murphy for the hours they put in supporting the team. 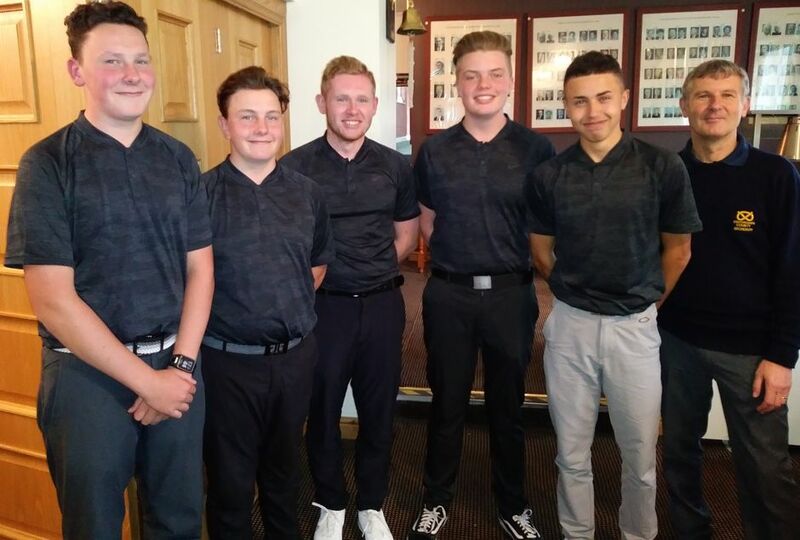 Finally congratulations to the members of the team L-R Ollie Read (Branston G&CC), Jack Gaunt (Drayton Park GC), Lewis Pearce (Walsall GC), Ryan Brooks (Whittington Heath GC), Jake Walley (Enville GC), Gian-Marco Petrozzi (Trentham GC), Martin Crook-Captain (Little Aston GC) and Tom Hewitt (South Staffs GC). A closely fought matchplay final between the 3 League winners resulted in a win for Trentham with 6.5 points, 2nd place Sandwell Park with 5.5 points and 3rd place Branston with 3 points. Thanks to South Staffs GC for hosting the event in glorious September sunshine on their fine test of golf. Details of results under Juniors, - Junior Leagues. Staffs Club Golfer Final at Newcastle-under-Lyme Golf Club. Congratulations to the winners Mark Homer (Druids Heath GC), division 1 with 36 points & Graham Sandland (Drayton Park GC), winner of division 2 with 39 points. Thanks go to Newcastle-under-Lyme GC for allowing SUGC to use their magnificent golf course. The winners pictured below with County Secretary Malcolm Eustace. 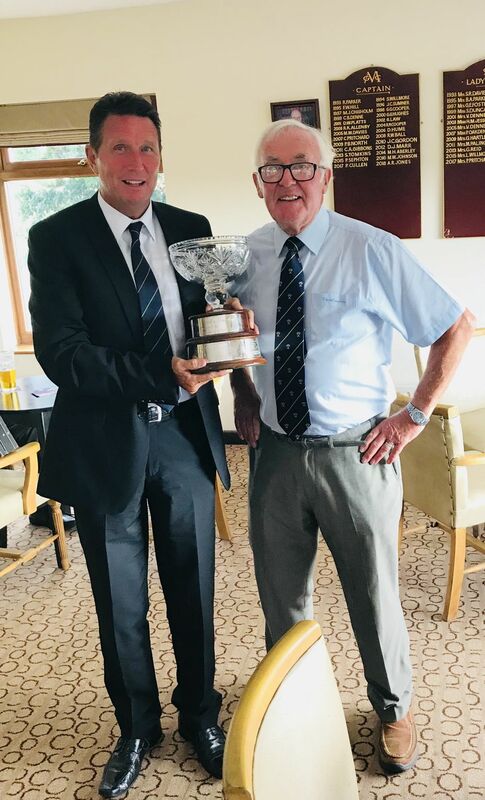 The Staffs Boys and Seniors Champions in their perspective event played at Woodhall Spa this weekend.The weather was not good, raining on and off all day on Saturday, so heavy at times that play was suspended for a period of time. The Boys Championship was cut from 36 to 18 holes. Ollie Read our boys champion played superbly well. Playing the Hotchkin course off the white tees about 6900 years, Ollie returned a fantastic score of gross 70 -3. He is a very talented golfer, his course management skills and excellent technique produced a round that included three birdies and fifteen pars. He could quite easily have made at least four more birdies, leaving putts on the edge of the hole. What was more impressive is the fact apart from his practice round on Friday Ollie had never played the course before. His 70 left him in a play-off for the title, which unfortunately he lost, but again he did not disgrace himself. He halved the first hole in birdies, parred the second for a half, birdied the third for a half, but unfortunately bunked his tee shot at the fourth extra hole and for those of you that know the course, you must avoid bunkers, he was unable to get a par which his opponent managed to do. It was great to witness a potential star of the future who was wearing his Staffs kit at the event. 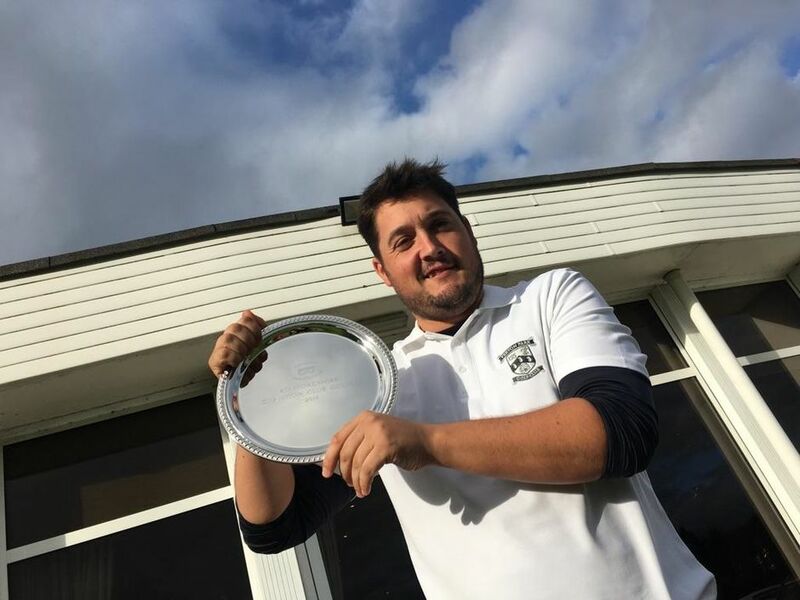 (Ollie also finished second in the Midland Champion of Champions Championship the weekend before, he consistently performs very well, his handicap is now scratch). 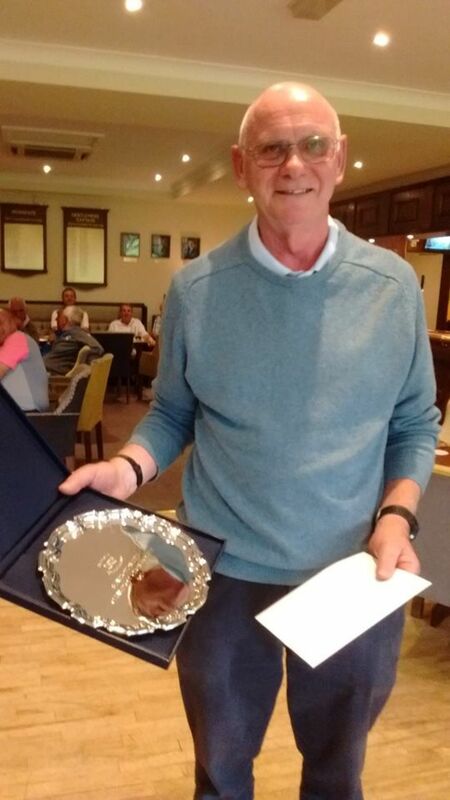 Colin Woolley our seniors champion finished an excellent 11th in the Seniors event, scoring an excellent 78/78 against the par of 73 for the 36 holes. Colin had never played the course before (playing 6600 yards) apart from his practice round on Friday and considering he made a triple bogey 8 at the sixth hole of his first round to leave him at five over par, he showed his experience and quality to complete the last twelve holes in level par. Staffordshire U14's 4.5 Worcestershire U14's 1.5 in singles only match. Full results to be found under Juniors - Under 14 Results. 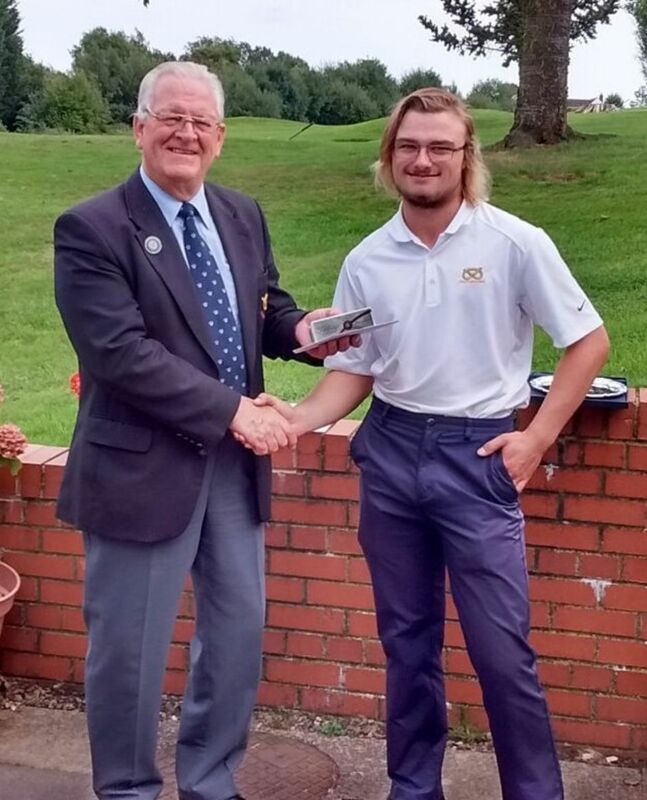 Congratulations to J Latham and M Kirton on winning the Autumn Membership Scheme competition at Bloxwich on the 6th September, with 41 points. W Perry and M Jackson, were the runners up with 41 points. A great end to the season with an away victory. 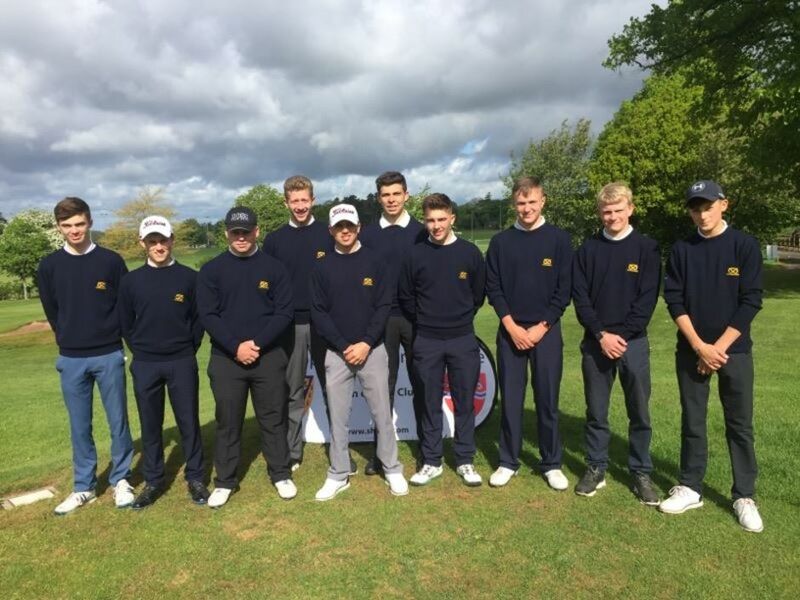 Staffordshire boys at the 'England County Boys Golf finals' played at the Northamptonshire County Golf Club last week. Finished tied for 3rd place after a great week of golf played by this talented group of young players. A strong Yorkshire Boys side took this year's title. Pictured L-R James Bailey, Ollie Read, Tom Beasley, Jack Smith (Captain), Charles Birchall (U18 Manager), Harry Fearn, James Wilkes and Alex Chapman. 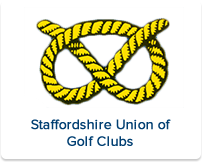 Results for the Midland Golf Union 10 Counties Under 14 Championship can be found under Juniors - Under 14 Results. Staffordshire U14's 3 Shropshire and Herefordshire U14's 3 in singles only match. Full results to be found under Juniors - Under 14 Results. Congratulations to Sam Astle (Oxley Park GC) winner of this years championship. Sam beat Zarak Curley (Leek GC) in the semi-final 3&2 and Seth Staton (Westwood GC) in the final 4&2. Seth beat Tom Morton (Drayton Park GC) in the other semi-final 5&4. Pictured below with SUGC Junior Chairman Mike Tunnicliffe L-R Sam Astle, Seth Staton, Zarak Curley and Tom Morton. The Final U18 League match was drawn 7.5 - 7.5, a good fightback by the Staffs Boys after losing the morning Foursomes 1 - 4. Congratulations to Worcestershire who are the West Midlands U18 champions for 2017. 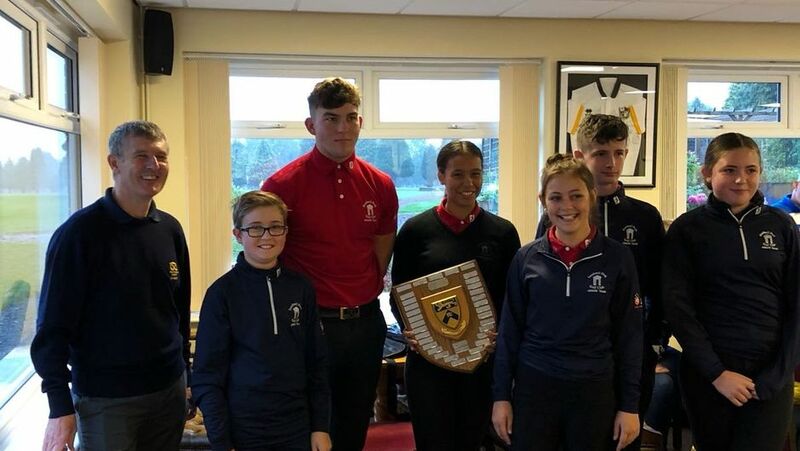 It is with huge pride and delight taht Staffordshire have two players chosen to represent England in the home internationals to be held at Moortown, Yorkshire. Gian Petrozzi (Trentham) and Jack Gaunt (Drayton) will play the round robin matches, against the other home unions, from Wednesday to Friday 16 - 18 August 2017. Please take a look at the England Gold Website, under the news section. Both these players fully dererve their call ups, after stellar 2017 seasons, Gian winning the Welsh Open by nine shots, and Jack who was runner up in the Englash Amateur. Many congratulations both, it has been an absolute honour to watch you progres this year. Last night the mens six squad had an inspirational evening with last men's team to win the English Couty Finals in 1974. Team work, foursomes pairings, practice rounds and preparation was discussed over a lovely dinner at Walsall Golf Club. The team have taken a lot from the evening, and I would like to thank Keith Hodgkinson, Trevor Homer, Chris Poxon, Andrew Dathan, and Martin Payne for giving up their time and being willing to re-live so many storeis. Thank you! 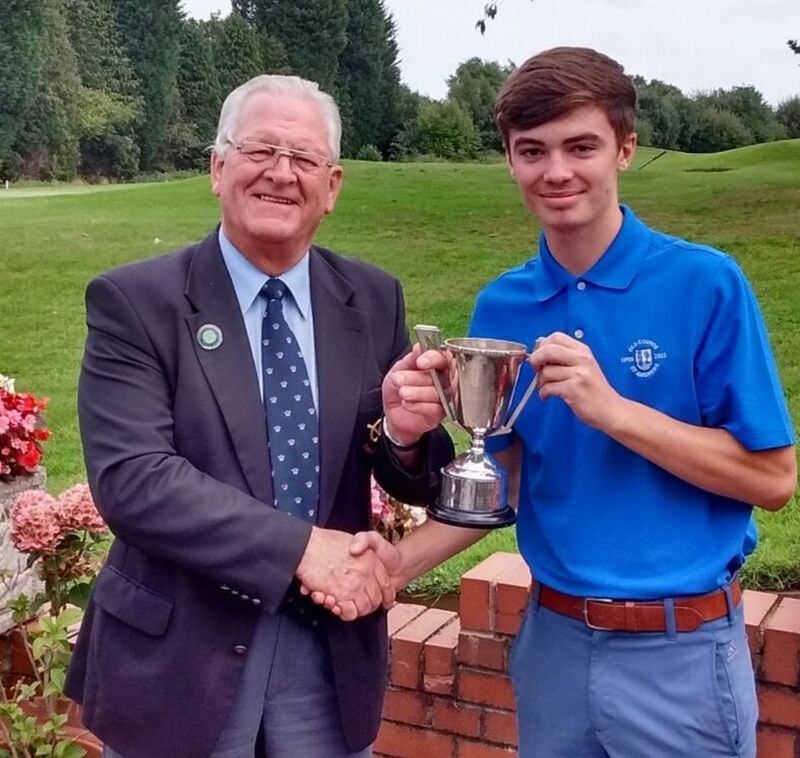 Congratulations to Ellis Muckley (Great Barr GC) winner of this years Championship with an excellent 36 hole score of 145 (70/75) beating Tom Beasley (The Chase GC) by two strokes. 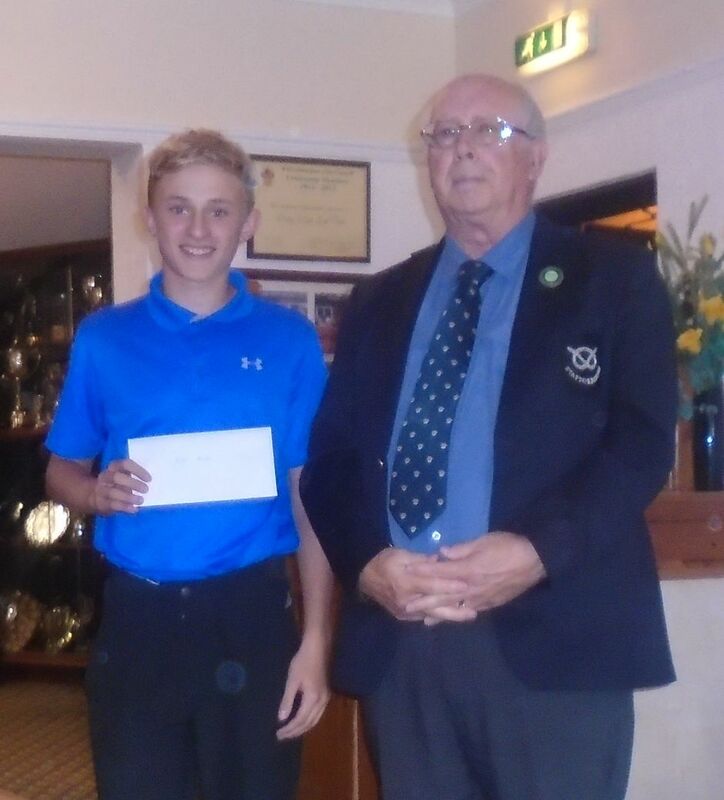 Also congatulations to Ethan Evans (Brocton Hall GC) winner of the nett prize with a great 36 hole score of 131 (63/68). A big thank you to Oxley Park GC who provided a great test of golf for the boys and looked after everyone exceptionally well. 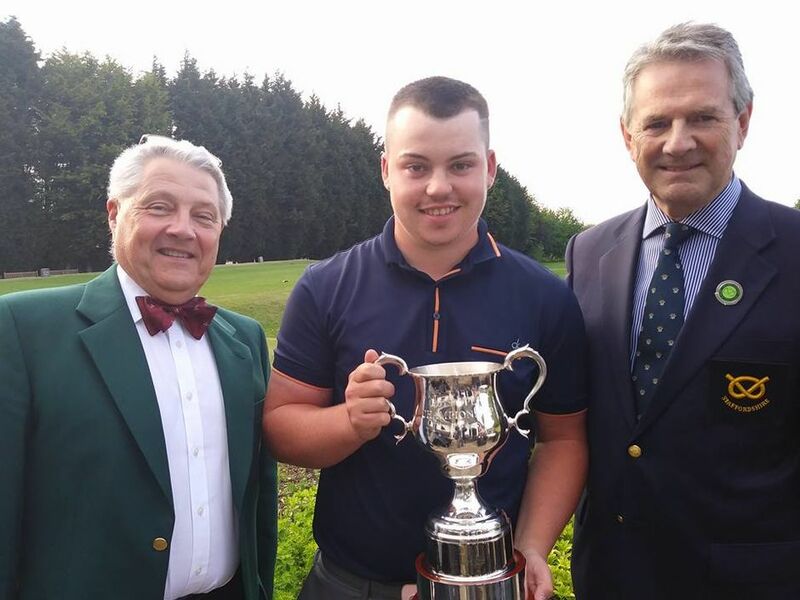 The winners pictured below L-R Ellis Muckley, Ethan Evans with SUGC President Martin Payne. Congrarulations to Dave Bowen of Great Barr in winning the Geoff Marks Trophy. 34 golfers played in the competition at a very well presented Stone golf course. As usual Stone were the perfect hosts. For the second year in a row a Great Barr GC member won the trophy. Dave won with 36 Stableford points. Dave is pictured with the County President Elect, Nick Weaver. 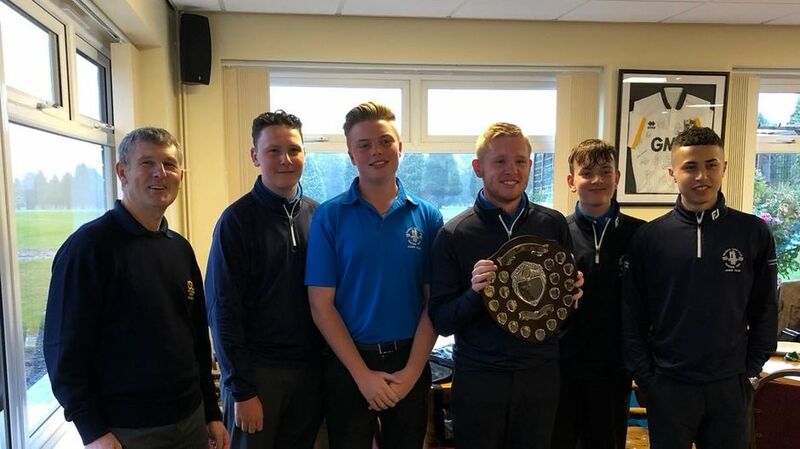 Congratulations to Ross Popescu and Jake Walley (Enville GC) convincing winners of the County Foursomes Championships played at Ingestre Park GC with an excellent score of 68 gross. Pictured below with SUGC President-Elect Nick Weaver. Staffs Men win the Midland 6 Qualifier played at Robin Hood GC on the 24th June. A fantastic performance by Captain Martin Crook and the team to come from 6 strokes behind after 18 holes to win by 2 strokes. All six players 36 hole gross scores count, so they are under enormous pressure to not make any mistakes, and thankfully they rose to the occasion. 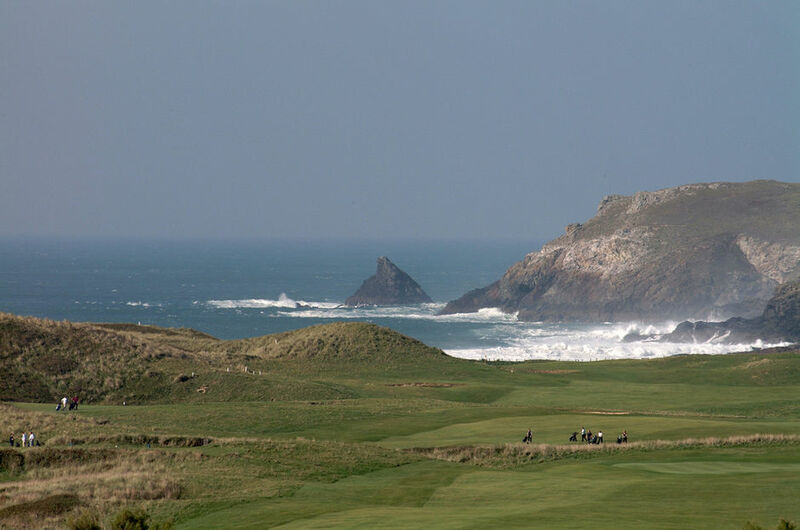 The team will now represent the Midland Counties in the County Finals at Trevose GC in September. 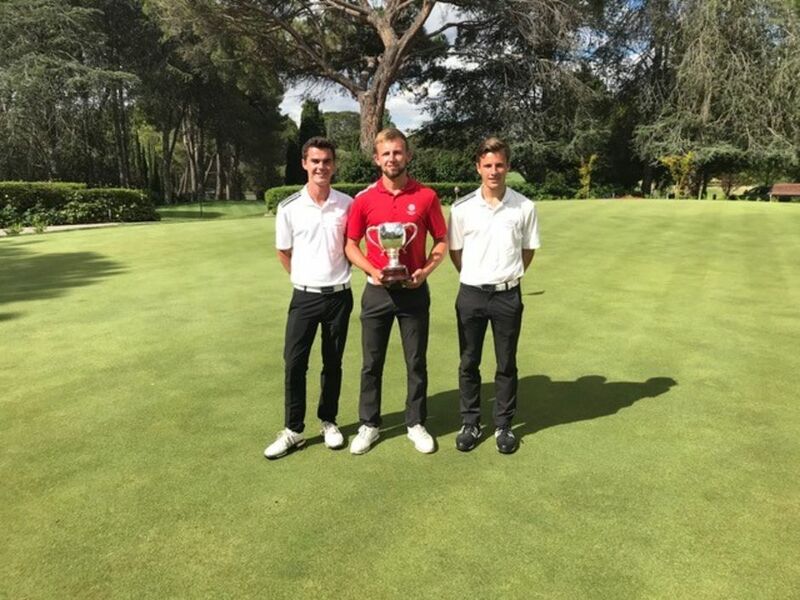 Further success was achived by Jack Gaunt (Drayton Park GC) winning the individual best score of the day 136 (68,68) -8 and Gian-Marco Petrozzi (Trentham GC) second on 139 (72,67) -5. 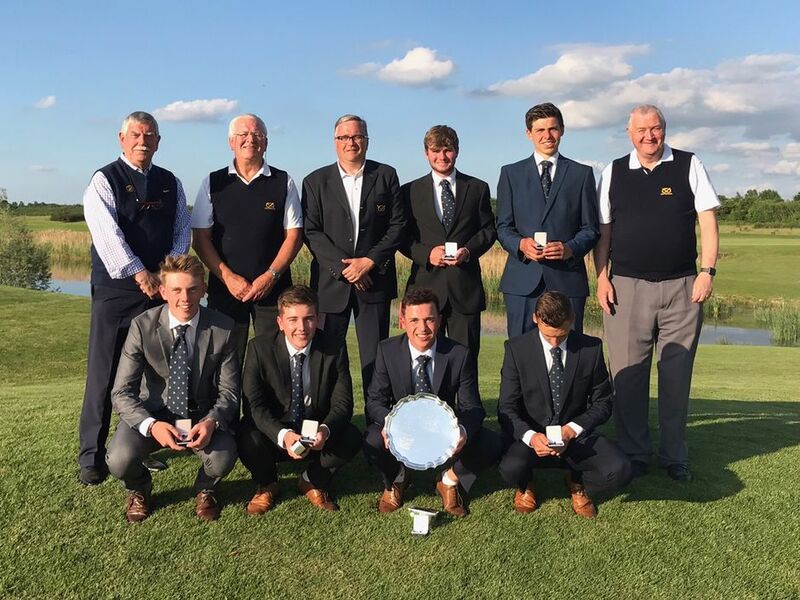 The successful team pictured L-R Lewis Pearce (Walsall GC), Tom Hewitt (South Staffs GC), Jake Walley (Enville GC), Captain Martin Crook (Little Aston GC), SUGC President Martin Payne, reserve Ollie Read (Branston GC), Gian-Marco Petrozzi (Trentham GC), Jack Gaunt (Drayton Park GC) and Ryan Brooks (Whittington Heath GC). Congratulations to Simon Higgins (The Chase GC) winner of the 2017 Staffs Matchplay Championship beating Ross Popescu (Enville GC) in the final 7&5. Simon was 8 under par for thirteen holes in the final. 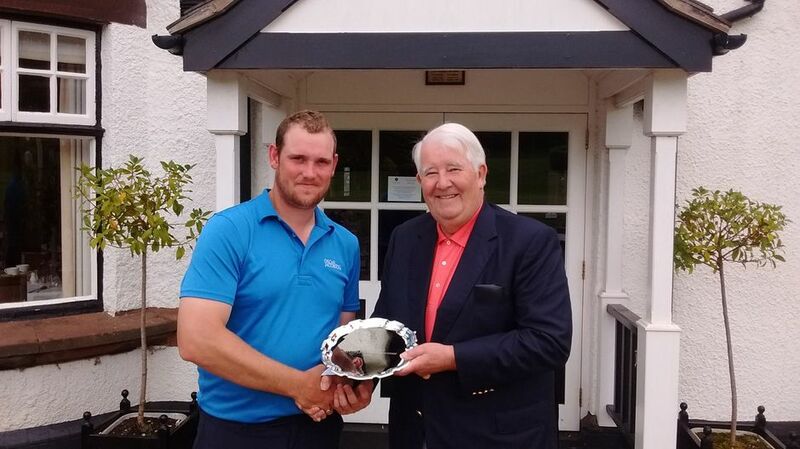 Keith Hodgkinson from Trentham GC pictured below with the finalist and presenting the winners salver. Congratulations to Gian-Marco Petrozzi (Trentham GC) winner of this years Staffs Amateur with a gross total of 141 (67,74). Pictured below with SUGC President Martin Payne. Congratulations to 2017 Staffs Boys Champion Ollie Read (Branston G&CC) 73,73. Pictured below left with SUGC President Martin Payne. Alfie White (The Chase GC) the Nett Champion with below right and Tom Alford (Branston G&CC) the U16 Champion below left. Congratulations to the team. Now off to County Finals in August. 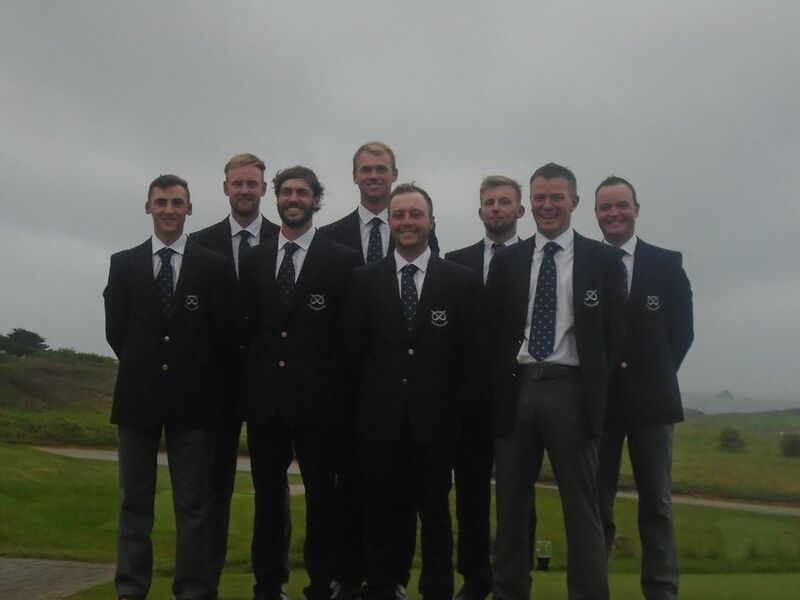 Staffordshire have dominated the Welsh Open Stroke Play, finishing in the first two positions. 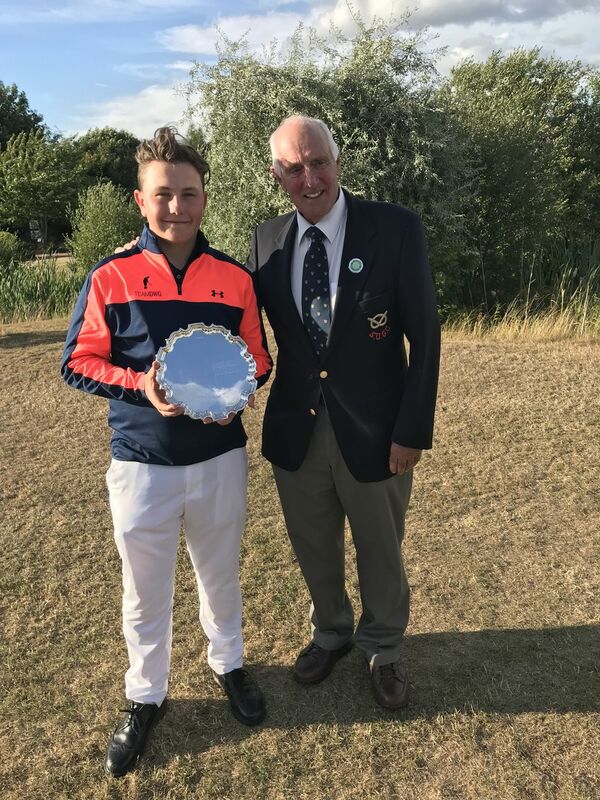 Gian Petrozzi (Trentham) dominated all week, winning the 72 hole world ranking tournament by 9 shots from Drayton Park's Jack Gaunt. Jack was five under par for the last two rounds that secured second place on his own. 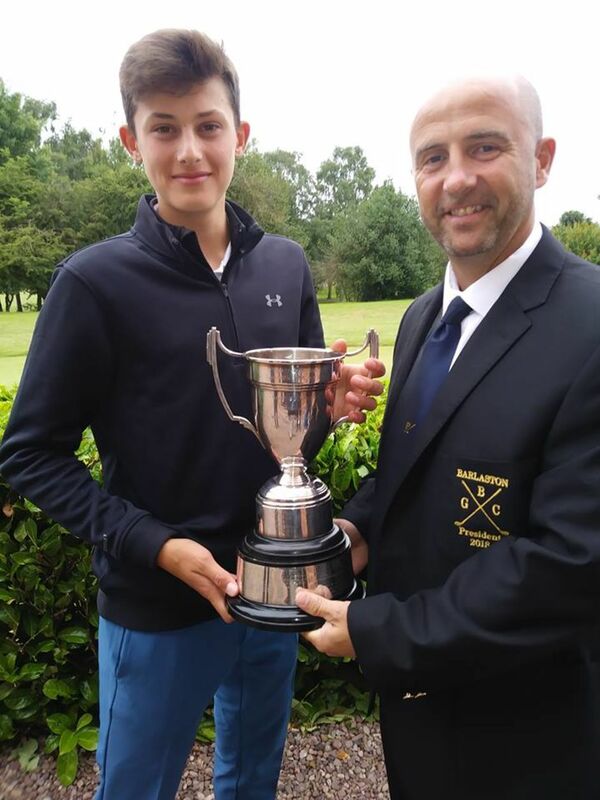 This is Gian's First National Title and was thoroughly deserved, finishing on a total of 13 under par around the Vale Golf Club near Cardiff. We could not be more proud of you both! Having our top players on form is great news, as the next few weeks are the busiest in the golfing calander. 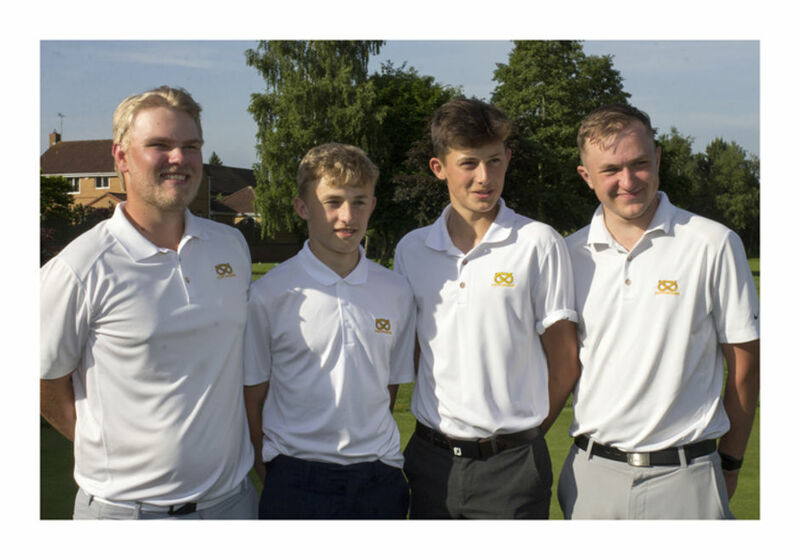 Over the next month our players will be competing at the Scottish Amateur, Brabazon, St Andrews Links, the Amateur and, of course, the County Sixes. This could be our year!! The great man himself John Loader pictured below. 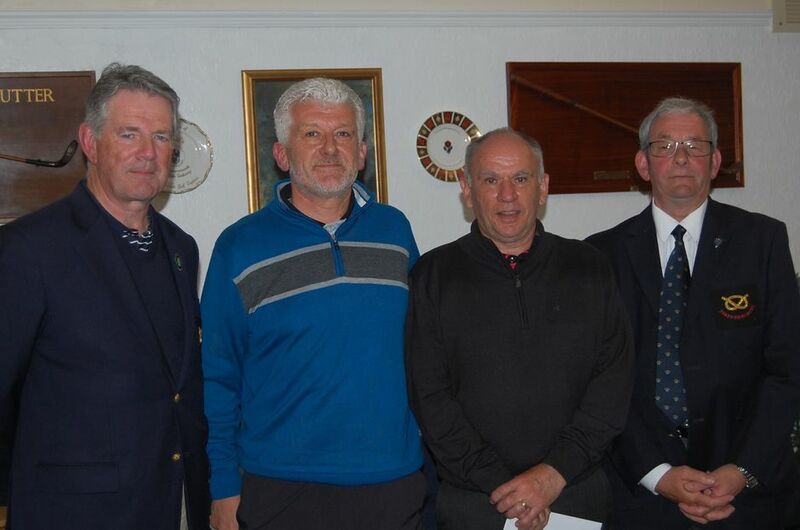 SUGC President-Elect Nick Weaver and Seniors Captain Glen Macbryde pictured below with the winners Richard Green and Roger Humphreyson to the left and Bob Barrett and Colin Woolley who finished third to the right. 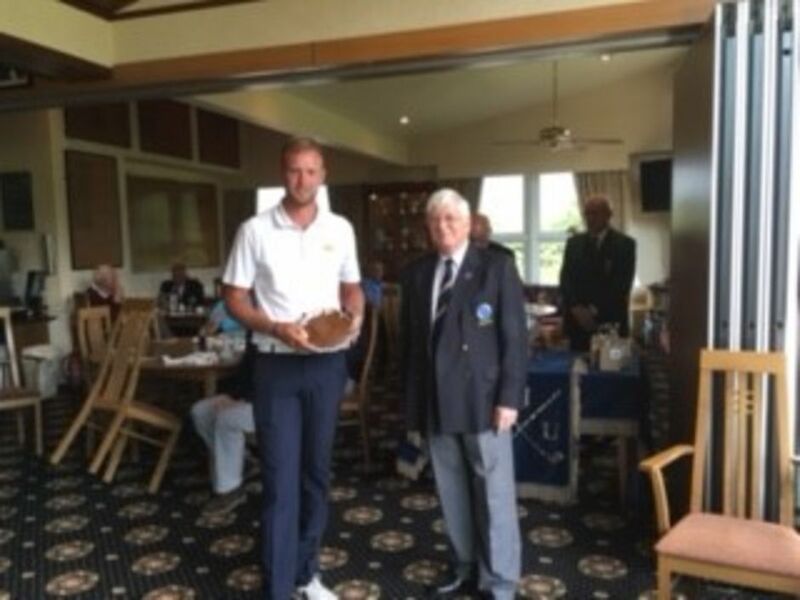 On a miserable dank and dark day in May more than 100 senior golfers across the length and breadth of Staffordshire congregated at OXLEY PARK to do battle for the much coveted LOADER TROPHY , the first of this year’s county senior events. The weather forecast was dire but mercifully no rain came and all combatants got round in the dry. OXLEY PARK was set up very fair and off the back tees it played its full length ; the rough was not too punishing and the greens were firm but true. 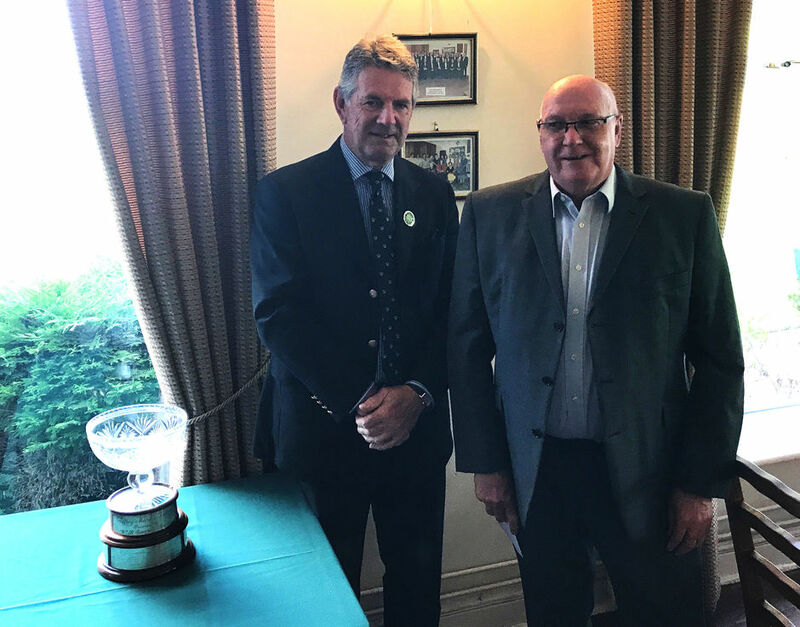 The trophy was won by Roger Humphreyson and Richard Green of South Staffs with a superb foursomes score of 75 , only 4 over par. In his valedictory speech Richard confessed that both he and Roger had been former members of Oxley and both had been club champions ; nevertheless both were to be congratulated for such an excellent score. Close behind them were a ‘youthful ‘ pair of seniors from Walsall –Clive Harper and Mark Hateley –who finished only 1 point behind. The best nett prize went to another Walsall pair of Keith Thorley and Richard Lowe with a fine effort of 70 being 1 under . in fact 3 pairs were tied on the same score and places were determined by a countback. One of the highlights of the round was a hole in one on the 14th by the venerable John Deakin of Sandwell pk ; whilst brushing the tears from his eyes as he paid for drinks in the clubhouse John admitted it that his last ace came nearly 40 years ago. All competitors remarked on the excellent state of the course saying it was tough but fair and moreover what excellent condition that the management of Oxley park had presented to them. 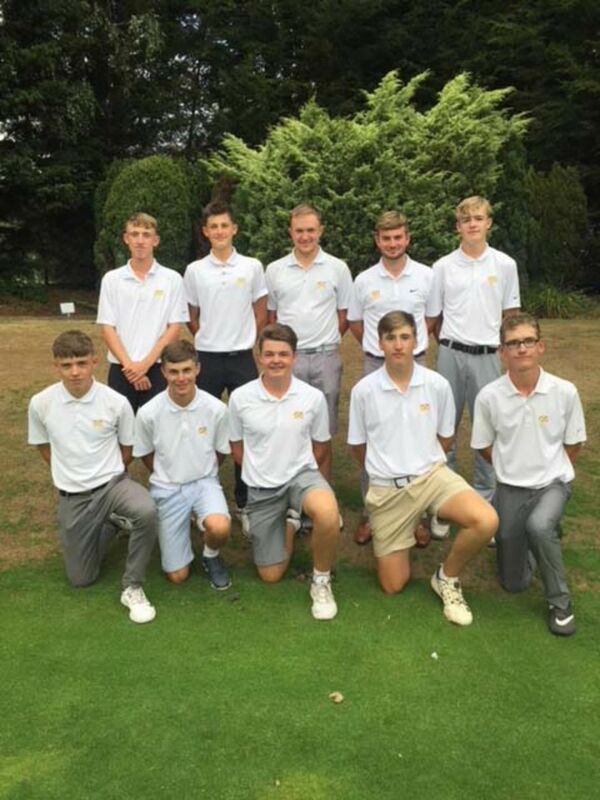 A close Boys league match against Shropshire & Herefordshire was played on Sunday 14th May at a good presented Lilleshall Golf Club. Staffordshire losing 8.5 to 6.5. The morning Foursomes finished all square with 2 good wins from the pairings of Tom Beasley / Ellis Muckley and Sam Astle / Tom Alford. The singles looked a very closed encounter all the way through the afternoon, under the glorious Shropshire sunshine, unfortunately we lost our two top key matches which left us relying too much on the back players. Tom Beasley going out at number three once again showed how well he has started the season winning 4&3 and 5&3 respectively. There were also good wins for Tom Farrar, Matt Sheldon & Tom Alford. Thanks go Mike Tunnicliffe, Jim & Mary Whitehouse and Michael Entecott for supporting the Boys during the day. 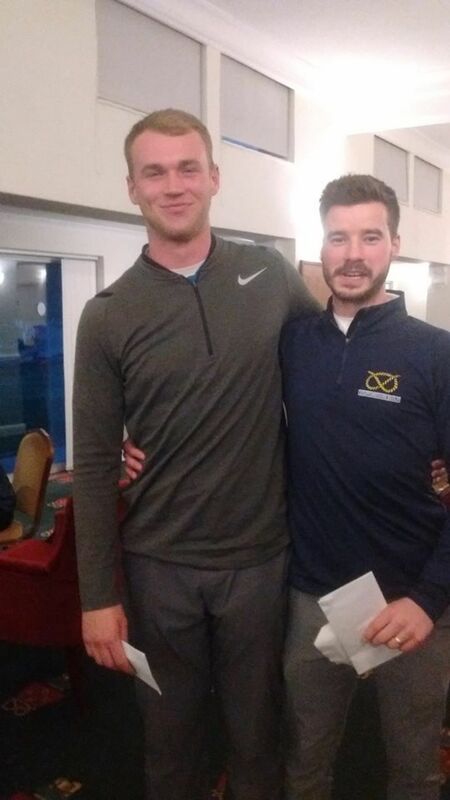 Congratulations to S Dyer and B Dyer, both of Aldridge Artisans, who scored 43 points to win the Membership Scheme Spring Meeting at Aston Wood GC. Pictured below Kevin Beattie (Trentham GC) and Rupert Wills (Trentham Park GC) who were playing their first county seniors match. Seniors Captain Glen Macbryde is in the middle. A good win for the men beating North Wales by 10.5-4.5 points. Several new faces recording good victories. Click here for match scorecard. 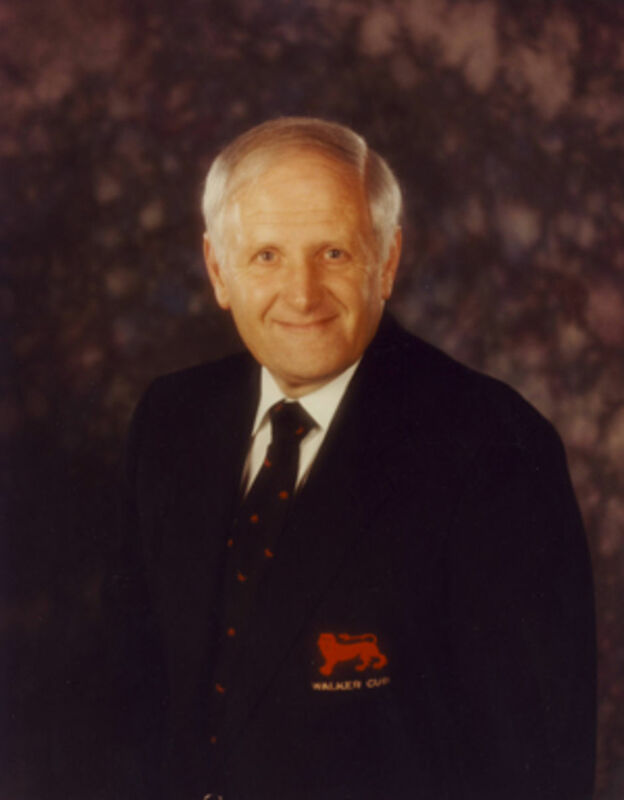 Geoff Marks, a past President of the English Golf Union and the first man to captain GB&I to Walker Cup victory on American soil, has died. He was 78. 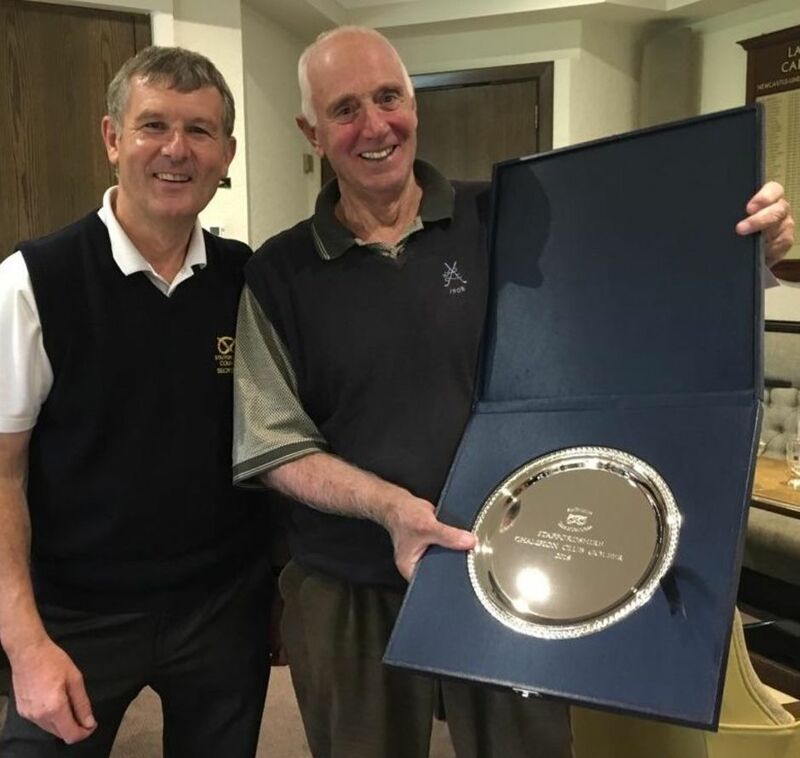 Geoff, who was a member of Trentham Golf Club in Staffordshire for 60 years, was appointed OBE for services to golf in the Queen’s Birthday Honours of 2008. His golfing career was peppered with highlights starting with early success as the Staffordshire boys’ champion of 1955. He played for England 65 times between 1963 and 1975, winning 45 times; and he played in two Walker Cups, before twice captaining the team. In his first Walker Cup match, at Milwaukee in 1969, he won both his singles, including one against Lanny Wadkins. In 1971 at St Andrews he was on the losing end of an encounter against Tom Kite. He was Walker Cup captain at Sunningdale in 1987 and followed up two years later by steering GB&I to an historic 12.5-11.5 victory at Peachtree Golf Club in Atlanta. He was also the England captain from 1980-83. After his playing career was over he became President of the English Golf Union in 1995 and also served on R&A committees – and shared responsibility for the pin positions at a number of Open championships. Geoff Marks was an architect by profession and partner for Scriveners and designed the offices and other buildings when the English Golf Union moved to Woodhall Spa in 1995. He was Staffordshire champion eight times and had been president of both his county and of his club, Trentham, where he had also been captain and a director.